With today’s soulless CGI-generated effects it is quite a blast watching something as hand-crafted as Thunderbirds Are Go, which makes extensive use of models and old-fashioned special effects. Thunderbirds is of course that 1960s British TV show that is best known for featuring puppets instead of real human actors. It was produced by the husband/wife team of Gerry and Sylvia Andersen, who is perhaps best known for Space: 1999 (1975-1977). 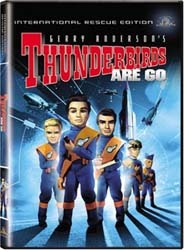 Thunderbirds however never got an American network deal which meant that the show was cancelled after only 32 episodes that originally ran from 1964 to 1966. The plot involves a Bonanza-like family unit sequestered away on a remote Pacific island flying the coolest spaceships and vehicles imaginable. Calling themselves International Rescue, this rather patriarchal outfit does things like rescuing returning missions from Mars (like in this movie). Anyway, Thunderbirds Are Go was made especially for the big screen during the height of the show’s popularity and shouldn’t be confused with any of the later “movies” which consisted of several episodes strung together. 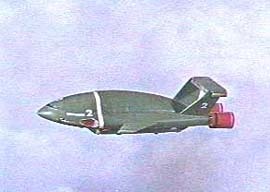 Despite kicking off well the movie ended up being a financial flop, but this didn’t stop the Andersens from making a sequel titled Thunderbird 6 with an even larger budget! Not surprisingly this movie also flopped . . .
Incidentally the re-edited TV movies I mentioned are: Countdown to Disaster (1981), Thunderbirds in Outer Space (1981) and Thunderbirds to the Rescue (1981). Not having watched any Thunderbirds episodes since I was a kid it was remarkable how well I remembered it. Also remarkable is, well, the plot – or lack of it. Thunderbirds Are Go picks up several subplots along the way such as saboteurs intent on wrecking said manned mission to Mars and hostile alien creatures on the red planet itself (actually the red planet looks pretty grey in this movie). Absolutely nothing is done with any of these subplots! There isn’t even any speculation as to what said saboteurs has to gain from causing a mission to Mars to fail. Maybe they’re just keen hobbyists? Who knows? Also remarkable is an endless launch sequence with which the movie kicks off. If you’re still awake after this glacially slow scene, then some fun is to be had with a surreal dream sequence involving Cliff Richard and The Shadows (yes!) as well as lots of meticulous model work and explosions, courtesy of British special effects legend Derek Meddings. Perhaps director Lane is too enamoured of Meddings’ handiwork because he tends to spend too much time of them instead of presenting us with a more linear and workable plot. Still, small boys ought to love this stuff (I know I did) unless they’ve been turned into media-saturated jaded cynics by the likes of modern special effects epics such as Van Helsing and the like. This is one trip down nostalgia lane I rather enjoyed and if I had a son instead of a daughter I would now doubt have purchased some of the old episodes on DVD (kids are handy as an excuse in that way). THE DISC: This Region 2 disc has an audio commentary by the director and co-producer Sylvia Anderson which is quite interesting. Image and stereo sound is quite good for a movie of this age. WORTH IT? 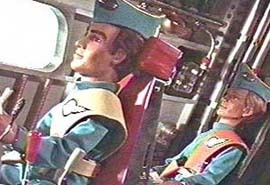 Thunderbirds Are Go is a blast from the past – if you can stay awake . . .